Which is bigger, Chile or Switzerland? Does Kenya pollute more than France? Who has more people, Colombia or Canada? Find out when you play Cardline: Globetrotter. Each player will have a hand of cards showing various nations, and will have to fit them into the growing line-up of countries. As the game goes on, it gets harder to guess where your cards can be played. Choose population, pollution, gross domestic product or land area, and find out where your nations fit. Easy rules will have you playing in minutes. Beautiful art on every card. 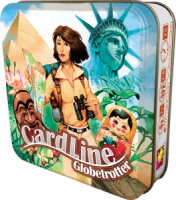 Add a Review for "Cardline: Globetrotter"